The control of inspection information as it applies to the medical industry is defined by FDA title 21 Code of Federal Regulations (21 CFR Part 11). QC-CALC’s data collection, storage, and reporting adhere to this important standard. Although this option has seen an increase in use by industries other than medical, it can be disabled for industries not requiring such strict control. 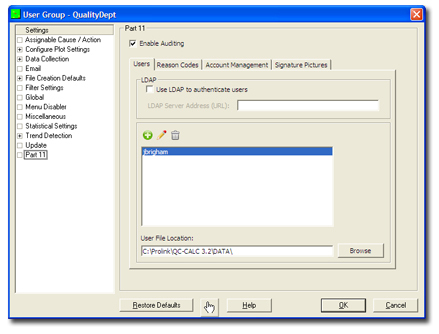 In the Administrative Tool for QC-CALC, the administrator sets up the Part 11 audit control creating valid users (or choosing LDAP) and reasons codes for changes in the application. This screen is shown at right. Our convenient account management features allow you to set user account password expirations, activate/deactivate user accounts, and keep watch over the system. Optionally log failed login attempts by users and deactivate user accounts after a preset number of failures to prevent brute force password guessing. Upon deactivation, optionally notify an administrator via email of the deactivation so the administator can take action. See screen shot on right. We chose to go beyond the Part 11 specification and offer support for both digital and electronic signatures when printing your report using the Signed PDF format. Digital signatures are simply invisible wrappers placed around the document by Adobe Acrobat that verify the signer, the reason code, the time it was signed and that no changes have occurred to the document since it was signed. This is a part of the Part 11 specification and is shown at the bottom left of the report. 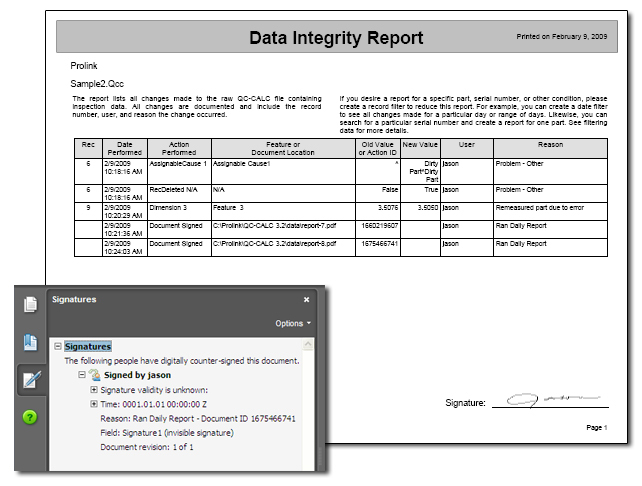 Electronic signatures, while not required by Part 11, are an actual picture of the person's hand written signature (shown in the bottom right of the report). Digital signatures only work well until the report is printed on paper since you cannot see them. However, a physical electronic signature on the document verifies the signature even on paper. 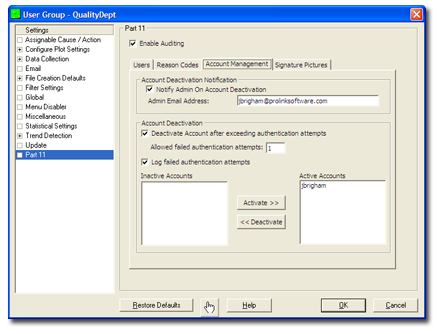 This feature is available whether you are using QC-CALC's internal user list or an LDAP server. Digital and electronic signatures are only added to the report if Part 11 Auditing is enabled, only if the Signed PDF format is chosen as the report output type, and only if the user correctly types their user id and password when running the report. There is no way to add signatures to the report without these three cases being met. This ensures security and integrity. Electronic signatures are simply images of the user's signature. You can quickly create them in paintbrush and upload them to the user's account (with password). They are stored digitally in QC-CALC to prevent tampering or replacement without authorization.